Mom's lasagna was always a treat around the holiday, especially Easter or Christmas time. She would make everything from scratch and it would take her a labor of love in hours. Homemade ricotta cheese, the lasagna noodles cut by hand, meatballs, sausage all from scratch! Of course now in busier times, we have all the necessary ingredients to make a lasagna in record times and it so much easier. Back in Bari, Italy where mom came from, everything was made by hand special during a holiday. You can use all store-bought ingredients and this lasagna will be a huge hit. Mom made her lasagna with hard boiled eggs in a layer, that was how her Region made it, you can skip that layer and just add more meat if you aren't a fan. Here is an awesome recipe for mom's lasagna, we miss her every day and make it in her memory every year. Easter and Christmas Day are our tradition to keep her spirit alive in the kitchen making this recipe. Lasagna is actually a layer pasta casserole. It's full of seasoned meats such as sausage and meatball mixture, ricotta cheese and sauce. One of the gourmet meals made in an Italian household during the holiday season. Usually served with delicious hard crusted Italian garlic bread, a good Chianti wine and nice antipasto salad. We always make a traditional homemade sauce (sugo in Italian) it's loaded with meatballs, sausage and braciole which is a stuffed meat roll. The sauce is usually made the day before or early Sunday morning after the meatballs are fried. We always had and still have fried meatballs for a Sunday morning breakfast tradition, mom always made a double batch. I now reminisce those days with mom in the kitchen beating the eggs and whisking the ricotta for the lasagna, brings a tear to my eye of those precious moments in time. I was so fortunate to be born into an Italian family! I really missed those days. But we carry on traditions now with my own sons and remember that wonderful smell of her cooking that is etched in our minds forever, it brings peace. Some folks are wondering about this layer, it's a traditional way mom made hers from her Region. We love it and they actually fight to get the egg as it's hidden throughout the lasagna and if you don't space it out evenly, you may not get one in your slice. It puts a smile on my face when someone yells "I found the egg". Just omit that layer if you don't care for eggs. I like to take the ricotta and mix it and set aside. I also do the same with the meat, saute, drain, add sauce to the meatballs and sausage and set aside. Set up an ingredient station so everything is right in front of you while layering, it makes this much easier. I also drain the noodles, never rinse them ( the sauce sticks better) the place them on wax paper so they don't stick together. This is a version of homemade lasagna from the Region my mom was from. In Bari, Italy her mom taught her to make this lasagna using a layer of boiled egg. That will optional to those not familiar with this version. Lasagna was always made during any holiday. Cook lasagna noodles al dente, drain and spread out on wax paper. In a medium bowl mix ricotta, 2 eggs beaten, 1 tablespoon minced garlic, 2 tablespoons grating cheese, mix until well blended. In a medium fry pan saute the sausage until cooked. Add to crushed meatballs, mix together. Add some sauce to this mixture around 1 cup) set aside. Line the 13x9 pan with a layer of noodles, switch directions as you layer them. First layer place hard boiled eggs on the bottom, spread with sauce on top, grating cheese, some parsley, another layer of noodles. Next add the meat, noodles more sauce some grating cheese, mozzarella. The last layer spread the ricotta on top and sprinkle with mozzarella, no sauce and some grating cheese with parsley. Top the ricotta mixture with lasagna noodles adds sauce more mozzarella, grating cheese, rest of garlic, any parsley left. Bake at 325 until nicely browned on top. Garnish with basil. I couldn't agree more Claudia. It's a shame that families don't have the opportunity to have time to spend with family on this the most family oriented day. When I was a kid, you were lucky if you found even a 7-11 open to get the flash bulbs that you forgot to buy to take pics of the pretty table. Because everyone knew it was Thanksgiving, and no one expected anyone to be open before 9am the next day. And now it's faster, earlier, in-your-face retail... Oh well, "the good ole days" are gone and we move on. I hope you enjoy the time you do get to spend with your loved ones. Thanks for all you do. Delicious lasagna that make my mouth water!Happy thanksgiving week,dear! This lasagna dish does look amazing. Your mom definitely had some talent in the kitchen and you are lucky that she passed these along. I am sure they conjure up wonderful memories also. We have 2 radio stations that switched to Christmas music 10 days before Thanksgiving. By the time Christmas gets here no one is in the Christmas spirit any more. Do the stores really make that much more money by being open at night? I was just listening to the radio and they said Black Friday isn't even a big savings day any more. The best time to save money is last 2 weeks before Christmas. By the way the lasagna sounds wonderful. I don't envy you having to have anything at all to do with Black Friday. I guess I'm fortunate to have the holidays off from work still, but I do miss the big family get togethers as a kid. I so agree with you, people should be home with their families, not out working (or shopping). I wish people would put an end to this by not going to the Thursday sales. Good luck with all the craziness! You're awesome - what a terrific classic lasagna! That's terrible Claudia! I'm sorry it's going to be a short holiday for you all to spend together. Your lasagna looks incredibly good with the sausage and meatballs! My Grandpa's side was from Bari too! Good luck working black Friday. You are right, job market is terrible. I've been looking for work for 16 months, filling out online applications going on interviews and nothing yet. I may have to try and get into retail. Your lasagna looks great. I actually hate black friday! The thought of getting up so early to fight people in the stores for some clothes just doesn't seem worth it. I hate crowds! But, I definitely don't hate this lasagna! We will be having my grandma's homemade lasagna as our first course on Thanksgiving! Opening all day on Thanksgiving Day... Our values are being eliminated, which is the source of ALL the problems we now face. Money and things are first and all else second. What if everyone cherished family and friends as much as you and I. Can you imagine the amount of joy... It would resonate around the world!! Hugs and Happy Thanksgiving to you and yours Claudia! Hi Claudia, I know how you feel. The past few years I helped out during the holidays at a kitchen store. I hated working when my family was all home and in from out of town. I do hope you get to spend some time with them. As for your moms lasagna it sounds fantastic. 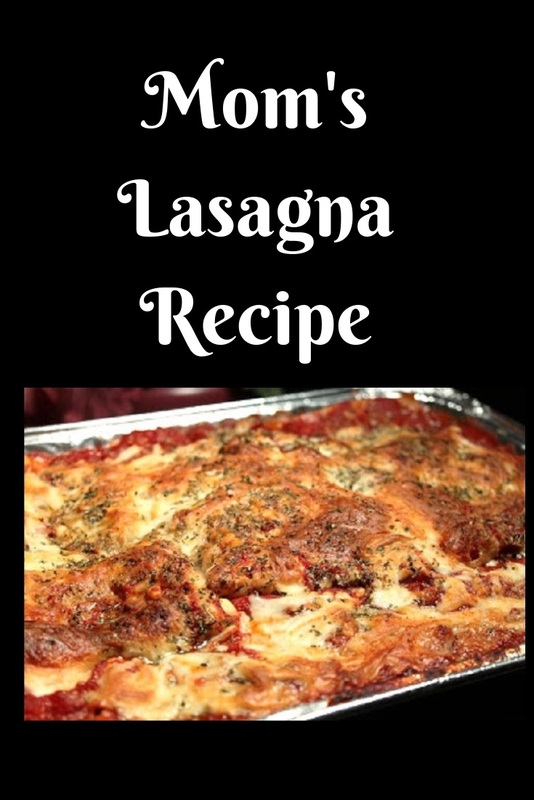 I adore lasagna and will print this recipe. I hope you have a Happy Thanksgiving! I am hugely disappointed in so many stores opening at 12:01 a..m. on Black Friday. I understand the need - in this economy - but I do feel that the same presents would get bought - at 6 a.m. I worked retail for many years during salad days. I liked the hustle and bustle of the holiday. I just wouldn't like being deprived of my holiday. It is a beauty - that your parent gave you - the recipes and the time together at the table. The lasagne is stunning and happily - lasagne can be made early. Wishing you "catch up" time later! I am so glad you commented on the early store hours. This is self defeating. A day to say thanks and being torn from the family. It is wrong. Dear Claudia, I don't know when shopping became the focal point of family. People schedule their gathering around when a store will open. This is such a shallow way of living. I know that times are hard. They are hard for everyone. So much has been lost in this transition. I wonder what these youngsters will remember. Their parents going shopping? I know that your family will have Thanksgiving everyday. You are a wonderful person with your values in tack. I'm glad making one of your mom's cherished dishes can bring you comfort. It sounds fabulous! Yes, I agree with you...Black Friday has gotten out of control. I'm sorry it affects your life and family time...that stinks!